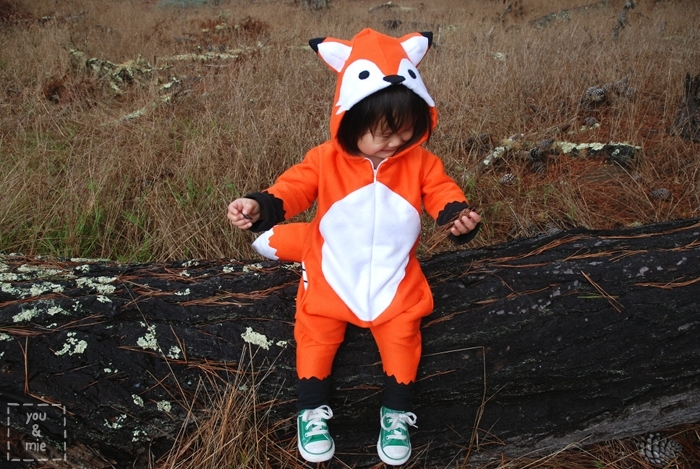 Happy Halloween from my sneaky lil fox! Happy Halloween! Today is a big day for us over here. Not only is it Halloween and Yuki’s first in preschool (meaning her first Halloween parade and party), but it’s the SF Giants Parade. We won the World Series! Again! And this city goes craaaazy when it’s time to party! It’s estimated that over a million people will gather to celebrate the win in our little city. But I’m gonna miss the party to hang out with this little fox and her classmates. When I made the Rain Cloud costume, I never thought it would be Yuki’s actual Halloween costume. I was proved right when Yuki hated the costume and figured out within seconds how to rip it off (if you’re wondering, there was a lot of pleading and a bit of bribery during our photo shoot :)). So I started a search for a new costume idea. Since Yuki does not like hats, hoods, ears, tails, or anything bulky hanging off her, I felt pretty restricted in my choices. I was trying to think of a costume that would require no more than regular clothes, but none of the ideas felt right or had any real meaning to her. 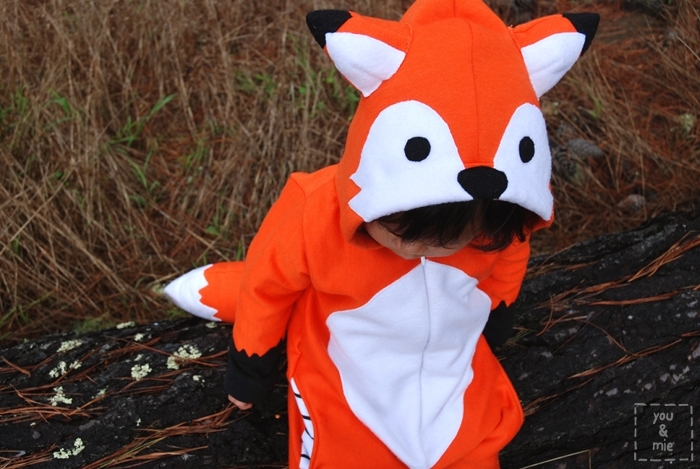 The fox idea was one of the firsts, but I quickly dismissed it because I knew Yuki would hate it. She’s into the show “Dora the Explorer” and she loooooooves Swiper the Fox. Swiper is the show’s villian. He’s a sneaky little fox that shows up and swipes things from the other characters. When she first started watching the show, she was totally scared of Swiper and she’d even cry a little when he came around. But soon she couldn’t stop talking about him. She’d take things and hide it behind her back and say, “Swiper took it!” I think it was part of her alter ego. 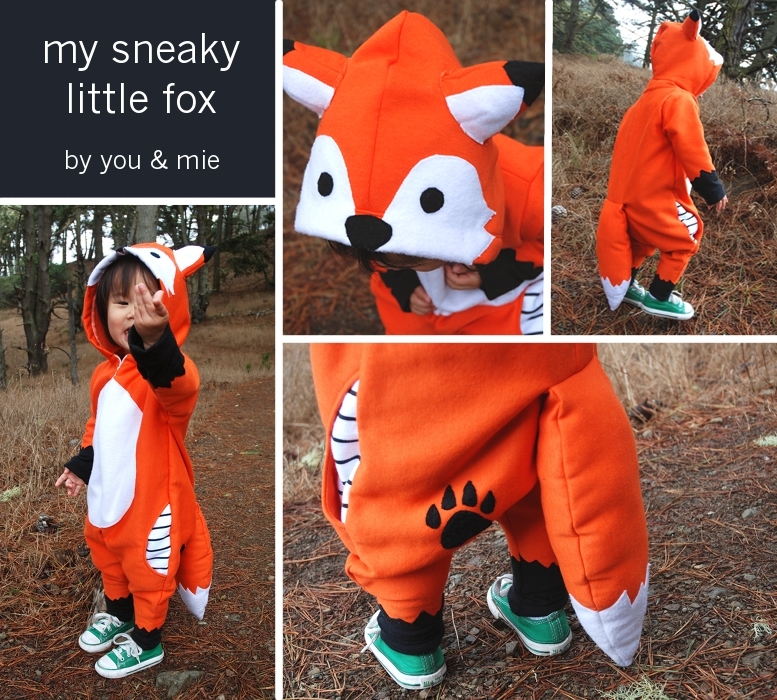 She would sometimes refer to herself as Swiper and also giggle and say, “sneaky fox! !” Pretty funny kid, that Yuki. Anyways, after considering dozens of other options, my partner, Hideko, persuaded me to go for the fox outfit because it suits her so well. 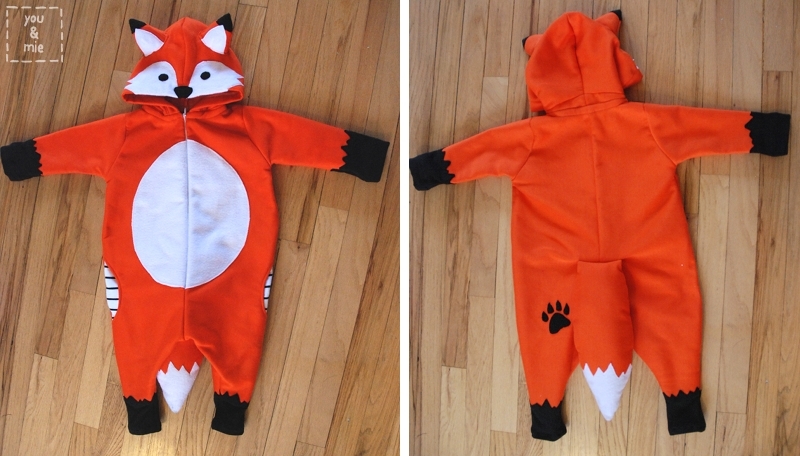 I decided not to make a Swiper costume, but just a regular ol fox. I have to say, I’m pretty pleased with how it came out! The costume is pretty similar to the Totoro costume I made last year in terms of construction. In fact, I used that costume to make the pattern for this one since it was the perfect size. I used sweatshirt knit which is soft inside and warm, but not quite as much as fleece. Unfortunately, it barely has any stretch which I thought was weird, but it still works. The white fabric is also sweatshirt knit, but I sewed it on with the wrong side out so it’d be soft and fuzzy. I moved the zipper to the front so I could attach the hood to the back and narrowed the wrists and ankles. I added visible pockets to the front. I wanted deep pockets for all the things Yuki would swipe (usually just rocks) and decided to make them contrasting for a fun visual look. I added a little fox paw print to her booty, just for fun too. All the details are just top stitched on. Gotta love that knit doesn’t unravel! So does she love it? No. I still have to struggle with her a bit to put it on and she definitely does not like the hood on (again, this photo shoot involved pleading and lots of treats!). 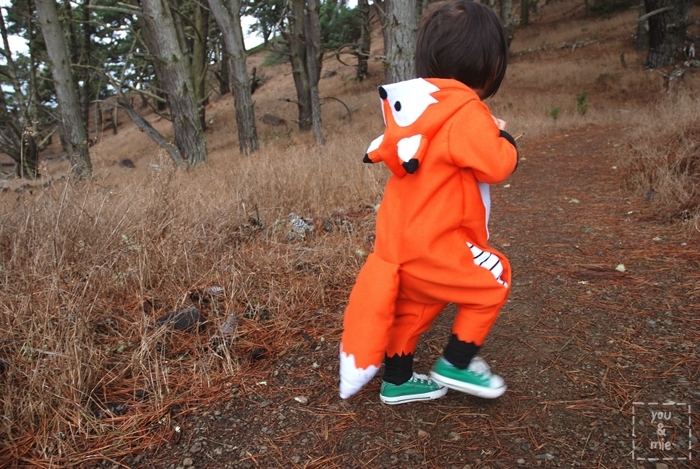 But I think she likes being a fox and she also gets excited when she sees other kids in costume. Big festivities for you tonight? 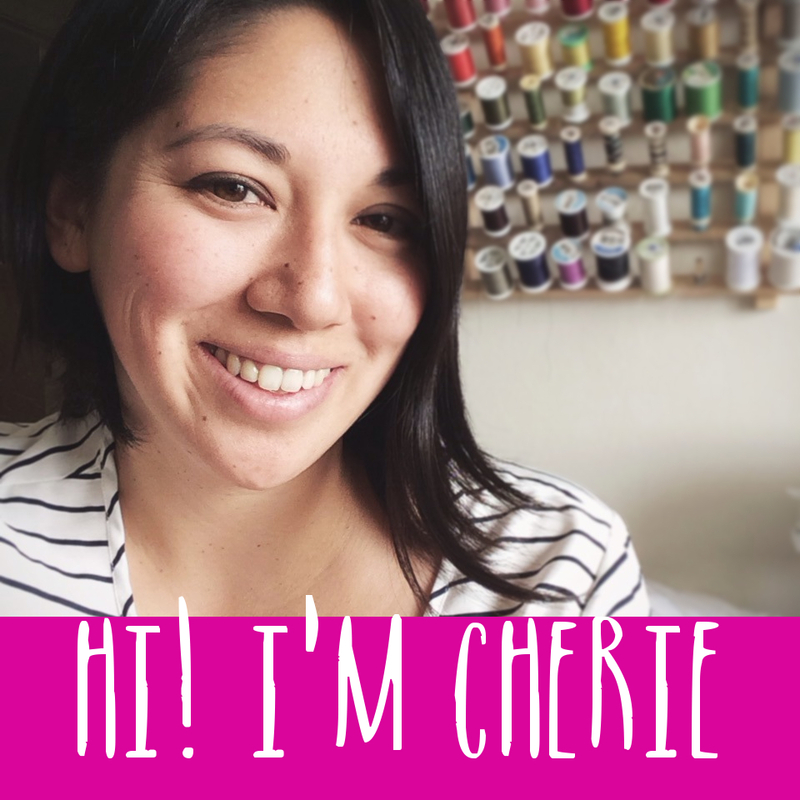 Finish your costumes in time? If you’ve made costumes for any of your kiddos, be sure to link it up at the Project Run & Play costume link up party and check out tons of other cute costumes! Happy Halloween to you and your family! And GOOOOOOO GIANTS!! !